You'll be £14.99 closer to your next £10.00 credit when you purchase At Hitler's Side. What's this? Order within the next 4 hours, 27 minutes to get your order processed the next working day! This is the personal account of a Luftwaffe aide always at Hitler s side from 1937 until the last days in Berlin, now published for the first time in English.Nicolaus von Below was a 29-year-old pilot when Goering selected him for the position of Hitler s Luftwaffe adjutant. He was with Hitler at every stage as the Second World War unfolded. His observations tell of Hitler s responses to momentous events as well as military decisions and policy-making at Führer Headquarters. This is a superb source describing life in Hitler s inner circle, relied upon on by Gitta Sereny in her biography of Albert Speer.He provides fascinating insight into how Hitler planned the invasions of Poland and Russia, what he thought of Britain and America, why he placed his faith in the V-1 and V-2 projects, how others dealt with him, and much more. Von Below was present at the assassination attempt in July 1944, and records the effect on Hitler and his followers. Von Below was the last of Hitler s close military entourage to emerge from the bunker alive. His frank memoir will appeal to anyone interested in how Hitler ran his war. He was denounced to the British in 1946 and imprisoned as a material witness at Nuremberg, until being discharged in 1947. Among those surviving the bomb blast of 20 July 1944 was Nicolaus von Below. We may think it fortunate that he did, for after the war he would produce this important memoir of the eight years he spent by the dictator's side. Von Below was Hitler's Luftwaffe Adjutant from 1937 to 1945 and this book is his attempt at conveying the reality of that experience, written from the perspective of an 0fficer in a position of trust, well-placed to observe key events during the rise and fall of the Third Reich. This he does without any distorting overlay of hindsight. He seeks to tell us how it was, and not how others might like it to have been, remarking in his disarmingly honest introduction that he has no wish to join "that choir which now condemns vociferously what once they so admired and who always knew at the time...exactly how things would turn out." Adopting a chronological rather than a thematic approach, the author discusses 0perations Sea Lion and Barbarossa; we hear about the signing of the Tripartite Pact between Germany, Italy and Japan; Hitler's interactions with Franco, Molotov and 0shima, and much else besides. Von Below was there when the news broke about Rudolf Hess's flight to Scotland in 1941 and when Fritz Todt died in a plane crash in what some regard as suspicious circumstances. The author shares his own recollections and interpretation of these matters, and also corrects, elsewhere, what he regards as the errors made by contemporaries like Albert Speer and a postwar historian in assertions about his acions during the period in question. Inevitably one wonders what, if anything, von Below knew, given his official position, about the Holocaust. To his credit, he makes no attempt at dodging the question. The answer he gives, and what he has to say about the action he took on the basis of certain information that came his way, and with what result, will not only shed light upon the matter but also tell us a great deal about the character and personality of the author (see pp 112-113 and 155). His portrayal of the man who was to cast such along shadow across the rest of his life is unique: the face the dictator presented to him is clearly far removed from the stereotypical image of the man brooking no contradiction and engaging in furious tirades. In this sense, the sections on 'Hitler's style of leadership' and how he reacted to 'critical voices' are important and make challenging reading. If at times von Below seems to want to highlight the purported human traits of Adolf Hitler, he is in no way an apologist hor him. The portrait he paints of the Nazi Leader, at least in relation to the period prior to 1941 ought, if anything, to enhance our understanding of the deviousness that was involved in Hitler's exercise of power. No less fascinating, for similar reasons, are a number of the photographs accompanyting the text. These appear to have been taken quite spontaneously, not posed, and thus convey something of the impression those around him in his entourage would have had at that time; they present an image quite different from those of the sterner 'Fuehrer' depicted by the regime's propoganda machine. 0riginally published under the title Als Hitlers Adjutant, this book has long been valued by journalists and professional historians, among them Gitta Sereny and Ian Kershaw. Its appearance now in English translation will make it accessible to an even wider audience. 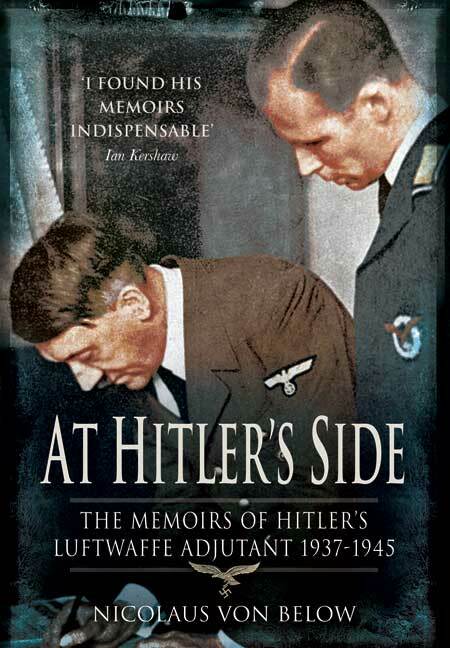 In At Hitler's Side Nicolaus Von Below offers an intriguing and unparalleled insight into the inner workings of the Nazi high command. From his vantage point as Hitler's Luftwaffe Adjutant, Von Below was not only witness to, but also actively involved in decisions and events that shaped the course of history in the 20th century, from the decision to go to war through to the regime's final desperate hours. A pilot at heart, the author in particular offers valuable insight into the politics that shaped the Luftwaffe's forces and role throughout the war. What separates this book from the myriad of other titles which lay claim to exposing the truth of Hitler's character and role within the Nazi war machine is the authors candour and sincerity. Admittedly a sceptic in terms of National Socialist ideology and always keen to avoid being dragged into politics where possible, Von Below attempts to avoid both speculation and the influence of hindsight to present a very personal account of his own impressions and perceptions of the events and people he encountered. This book takes you on an astonishing journey, alongside Hitler himself, throughout every stage of the Second World War. At the age of just twenty nine, Nicolaus Von Below was selected by Goering for the position of Hitler's Luftwaffe adjutant. From that moment in 1937, he saw the Fuhrer almost daily for a period of eight years - right up to the famous final days in the bunker when Von Below was the last of Hitler's entourage to emerge alive. The book is a very candid and intimate portrayal of life with Hitler during the campaign and provides a unique glimpse into the world of the Nazi military leadership and their decision-making processes. The accounts of Hitler's responses to the events of the war are utterly compelling, as is the insight gained into his, and the Nazis, military plans and tactics. Amazingly, Von Below was also present at the attempted assassination of Hitler in 1944 and his astonishing perspective of that event and its far-reaching effects is also recounted here. An unequalled and highly compelling account of Hitler's war that is totally unmissable, it also contains some intriguing personal photographs of Hitler and those around him. Nicolaus von Below was a 29-year-old pilot when Goering selected him for the position of Hitler’s Luftwaffe adjutant. He was with Hitler at every stage as World War II was planned and unfolded. His observations tell of Hitler’s responses to momentous events as well as military decisions and policy-making at Führer Headquarters.